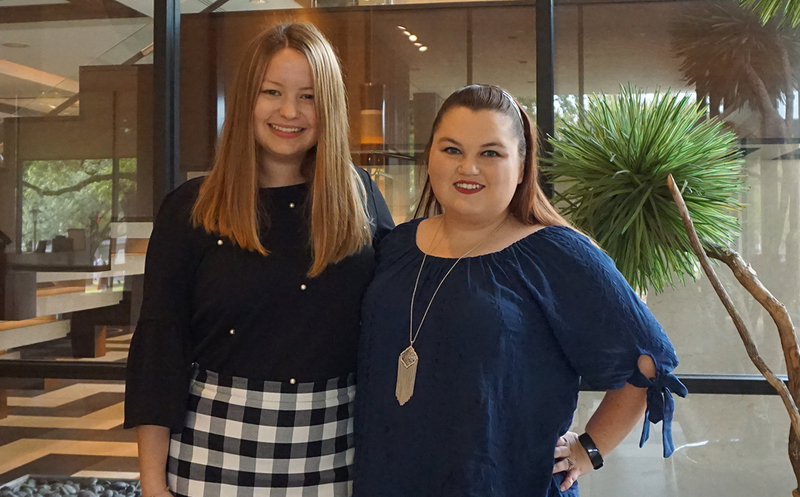 Once again, members of the National Association for Catering and Events (NACE) UH Chapter have received top honors at the 2018 NACE Experience Conference, held July 22-25 in Palm Springs. Caitlin Fuller (’18), right, won the National Student Member of the Year Award, while senior Olivia Fagerman took home the Vince DeFinis Scholarship. Fuller has been an active member of NACE from day one. As a freshman, she held the position of community service chair. She became 2nd vice president of membership her sophomore year, then led the student chapter as president during her junior and senior years. By the time she graduated this past May, Fuller had accepted a full-time position with Kat Creech Events, an award-winning wedding design and event planning firm based in Houston. Owner Kat Creech (‘99) is also a Hilton College alumna. At this year’s conference, Creech won the George Zell Spirit of NACE Award for her contributions to the industry and to the city in the wake of Hurricane Harvey. In a tweet last December, President Barack Obama praised Creech for turning a postponed wedding into a volunteer opportunity to help those affected by the storm. With the Vince DeFinis Scholarship, Fagerman received $4,000 for tuition, plus a package of career development tools that will provide her with opportunities to interact with industry leaders and participate in NACE education programs throughout the year. This coveted scholarship is awarded to the student who best demonstrates outstanding leadership capabilities. It is given annually in memory of the founder of NACE’s first chapter. Fagerman is this year’s student chapter president, a position she has held since the end of her junior year. As a freshman, she held the position of fundraising chair, and held dual roles as secretary and treasurer her sophomore year. She is set to graduate this May, and plans to work in event planning. Also representing Hilton College at the conference were Emily Copeland (’18), Janell Sabado (’18), Anna Oakes, Alli Hessel, Kendall Paulsen, Amara Shaikh and Lyndsey Goodnight. Under Goodell, the UH Chapter has become the largest student chapter of NACE in the country.